← The Year of the Dragon Approaches! It’s been a great 3 weeks I’ve spent in America, visiting with my parents and friends. My holidays are almost finished so it’s off to China tomorrow, leaving on a noontime flight out of Indianapolis, to Detroit, to Shanghai, to Chengdu for the dog pick-up, to Nanning and then a 3-hour busride return to Longzhou. The spring semester is about to begin, and so is my last months in this small town before heading off to a new placement in the country. 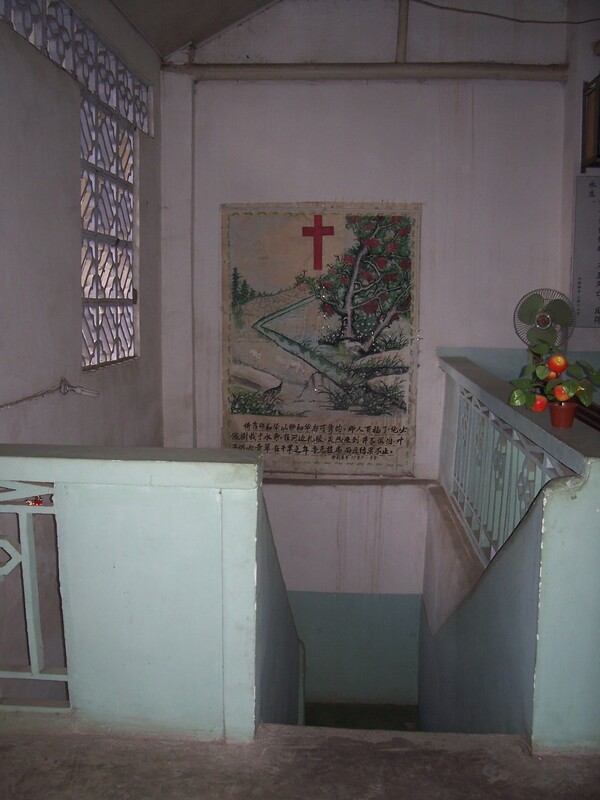 During my time in Marshall, I did manage to finish my newest newsletter, which was about the Longzhou Protestant church. I’ll include parts of that here for those who are not on the newsletter list. Enjoy! This will be our last semester in little Longzhou (loh-ng joe) before moving this summer to the new campus in Chongzuo, 1 ½ hours away. Over 8,000 students have been residing and studying on the new campus. Our old campus has only 600 this year, with 50% being English language majors enrolled in the 3-year program. (The 3-year program would be the equivalent of aU.S.junior college education.) This 3-year program will no longer be offered after all students have moved to the new campus. Only 4-year degrees will be offered. At present, I have no news of where I will be moving in June. The next newsletter will certainly tell all. 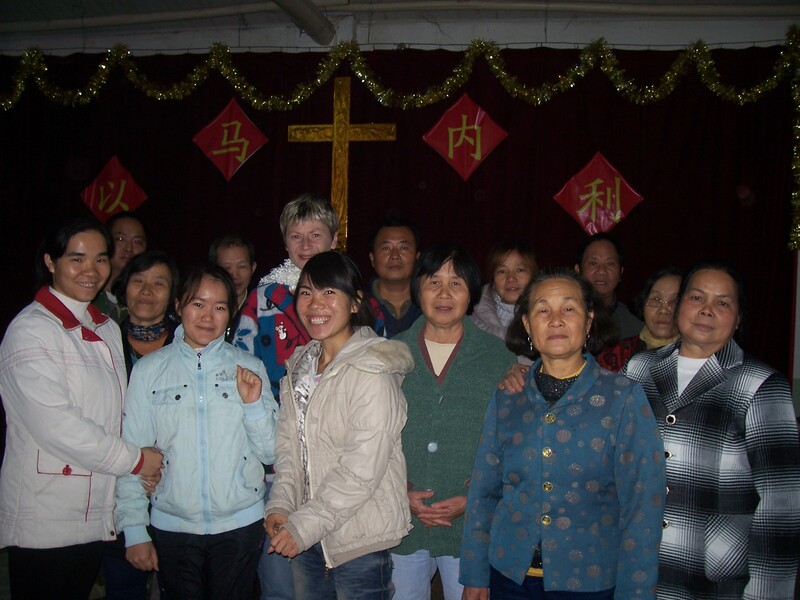 For this update, I’d like to share more about the Christian community here in Longzhou, namely our small Protestant church and its warmhearted, welcoming members. Entering the 100-year-old sanctuary of theLongzhouProtestantChurchis one which leaves me in awe of the power of the Lord’s work in this small town. The French missionaries to this area did their work well. They established a strong Catholic church (currently in a glorious new building across from our school’s front gate) and a less flamboyant Protestant church, located along the riverfront in its original structure. In the 1800s, the streets of this booming river town were filled with French nationalists. France’s plans to colonize southernChinawere progressing quickly. The first French embassy was established in Longzhou. The first overseas’ customs office was set up at the Vietnamese-Chinese border, just 40 minutes away. Trade between the three countries flourished with the French in the middle, seeing to the oversight of goods coming and going via waterway, train and roads. After the Sino-French wars (1883 – 1885), foreigners weren’t quite as welcome but their influence remained both in architectural building designs and in religion. Today’s Christian churches, blossoming under Chinese Christian leadership, are a testament to that. The Longzhou Protestant church is one which doesn’t get much recognition in the town. Its location is in the off-beaten alleyways of old Longzhou and is sandwiched between the Chinese National Lottery office and a bicycle shop. The tiny sanctuary is on the second floor of the century-old building. Newly painted aging wooden beams and a fake ceiling bring an updated look to this time-weathered worship center. Thle small 100-year-old sanctuary, with Amity hymnals in the back. 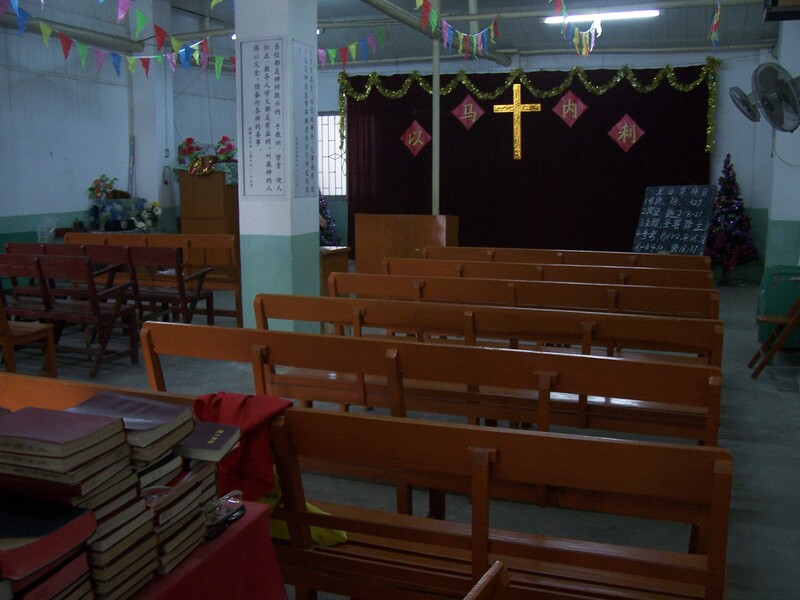 There are 20 members, mostly the elderly, who attend services every Sunday from 9 a.m. to 11 a.m. An ordained pastor from Nanning comes every month to give communion and the message. Layperson Zhou Ning, a vibrant young woman in her 30s, leads services when the pastor isn’t present. Wednesday night prayers are also held from 8 to 9 p.m. for those who wish to attend. Amity Foundation Bibles and hymnals are available at the back of the room for parishioners to use. Another Amity publication, tapes of all the hymns in the hymnal, is used to lead us in song practice and worship. Zhou Ning is the one in charge of starting and stopping the tape during our services. There are no fancy chordings or flowery embellishments. Hymn tapes are single notes, clearly plugging out the melody again and again to get everyone through the verses. 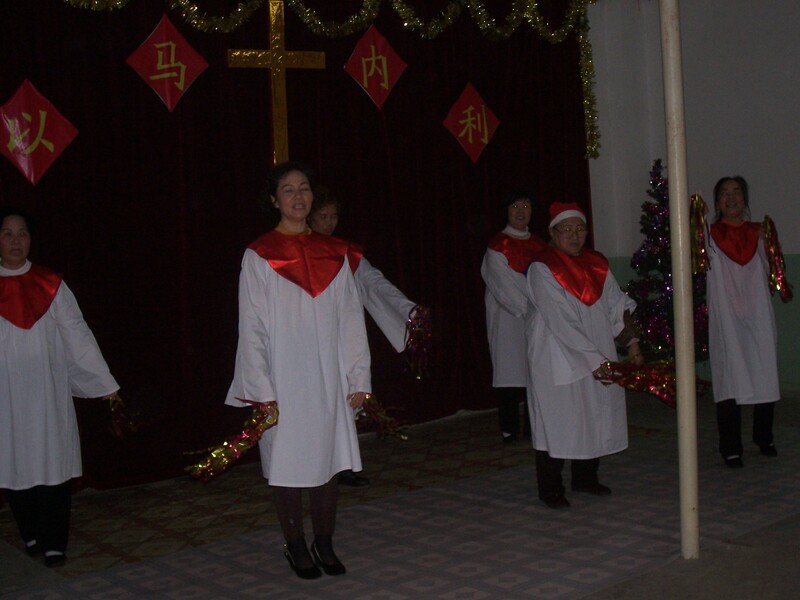 For many Christians inChina, hymns are new tunes, quite a few being our familiarWestern melodies. These are a bit strange for Chinese ears thus the need to simplify the music for those congregations without pianos. 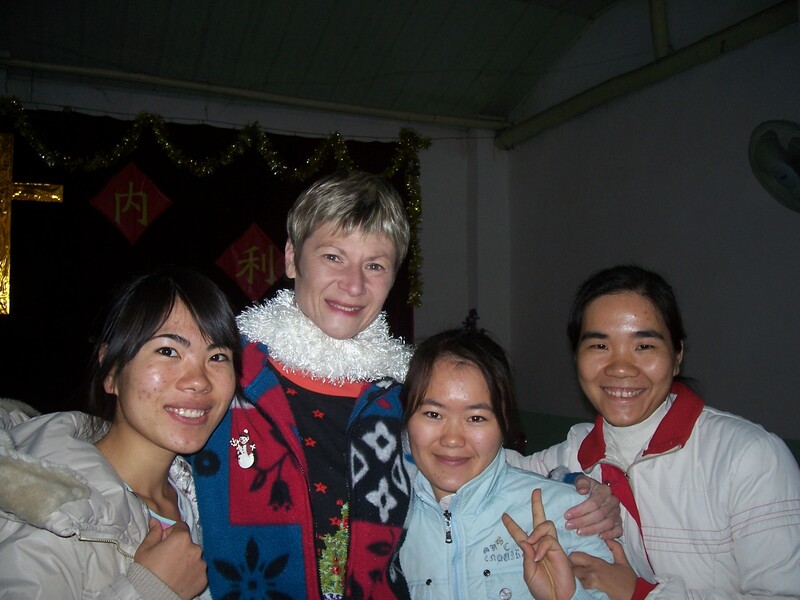 Christmas morning and the evening of Christmas day saw myself, my Christian student, Cherry (Wei Fang), and four of her classmates enjoying celebrations together. These are my first year students, those in my Business English class. Ever a good evangelist, Cherry always invites her non-Christian classmates to attend church with her every Sunday. 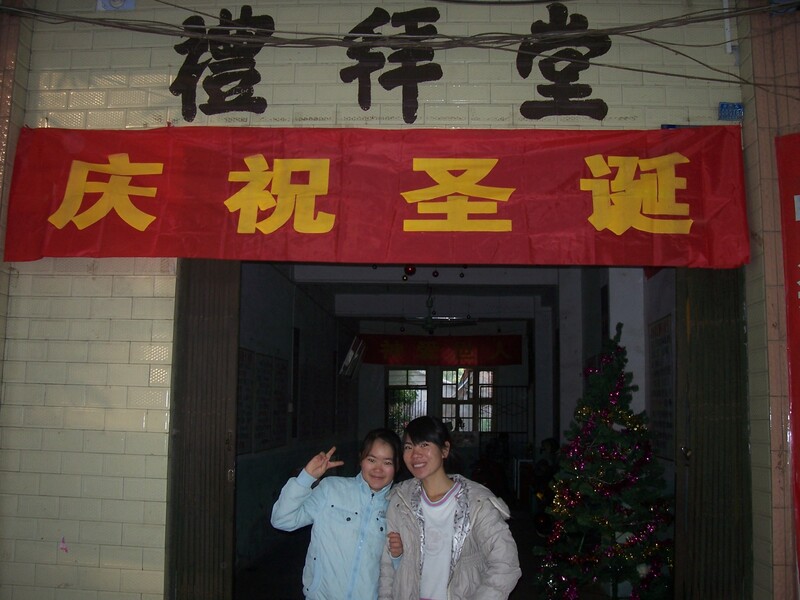 In her hometown, the huge city ofLiuzhou, she and her family regularly go to church, over 1,000 strong in membership. 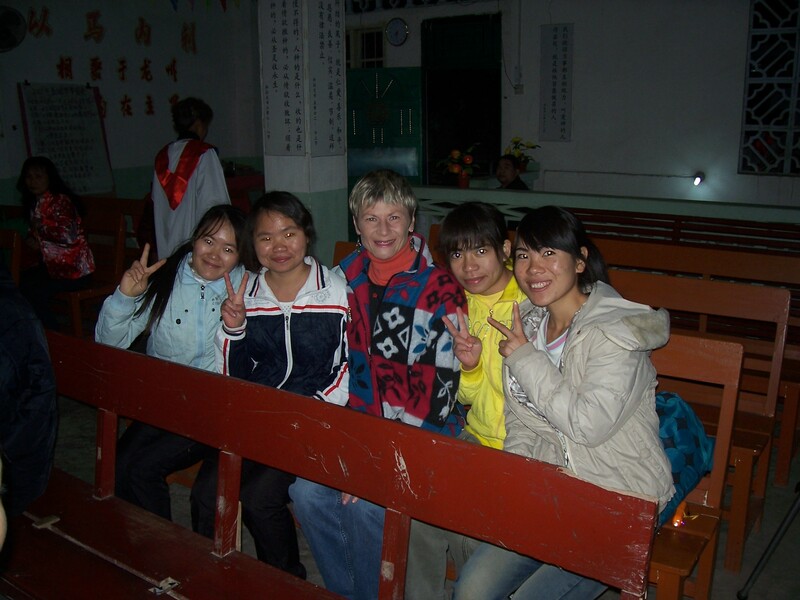 It was quite a shock for her to land in tiny Longzhou where the congregation is much smaller, certainly much older and services are a quiet affair. Yet her love for Jesus sends her to worship every Sunday with the same enthusiasm and faithfulness as at home. After attending worship in the morning, Zhou Ning invited us to return that evening for the 7:30 p.m. performances. 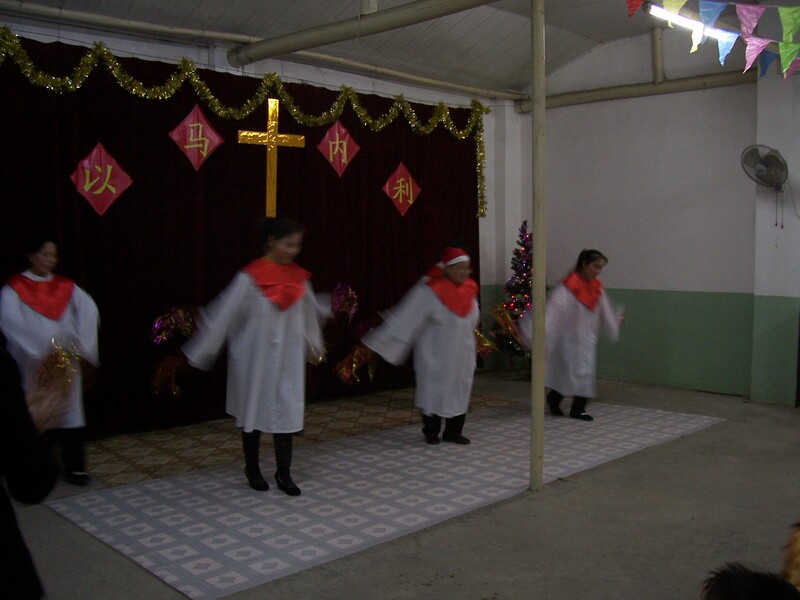 This is a custom of Chinese Christians, to celebrate Christ’s birth in song and dance. 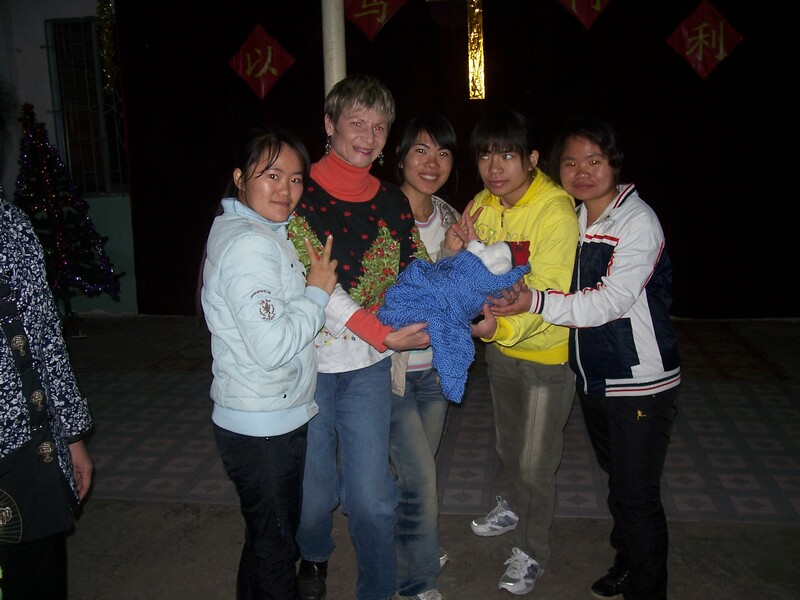 My students and I met in my home later in the day to practice our performance, Away in a Manger, in both Chinese and English. To add some drama, we wrapped baby Jesus (a holiday bear) in a prayer shawl given to me by Paris 1st UMC. On the last verse, we rocked Jesus and passed him along our row of singers until the end. After lifting him high for the congregation to see, we knelt to peer at his little face for our grand ending. Getting ready for our performance in the evening. My students enjoy singing hymns for the first time at our Christmas Eve services. A great liturgical dance number! 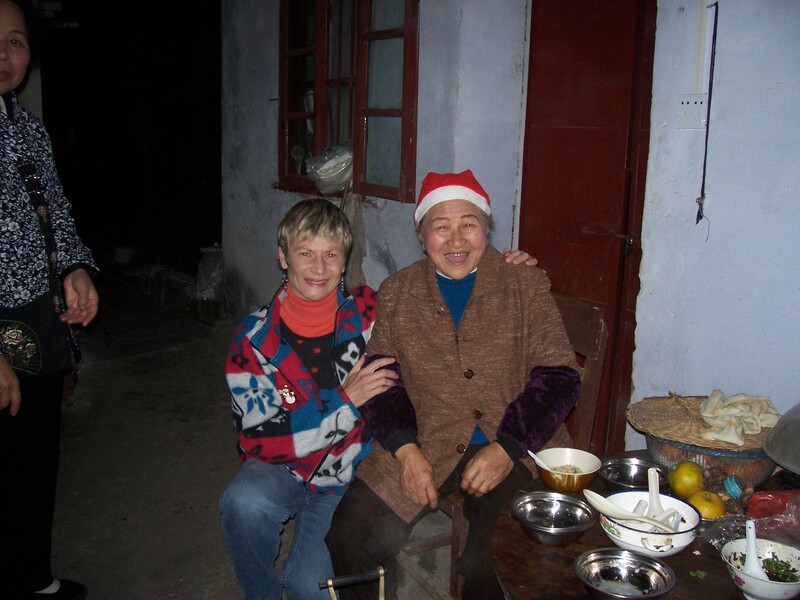 Later, one of the elderly members came up to us and said she was moved to tears, seeing the foreigner with so many young Chinese in her church on Christmas day. Never had this happened before in all her years attending worship. All together, we had over 15 performances. The choir had several attire changes, from festive fan dancing garb to choir robes to satiny liturgical dance dresses. Solos and duets were added by parishioners. We were a small group in the congregation, about 25, but there was no need for a packed house. The joyful spirit of this day was upon us and that is all that we required. At 9:30, the last group sang. 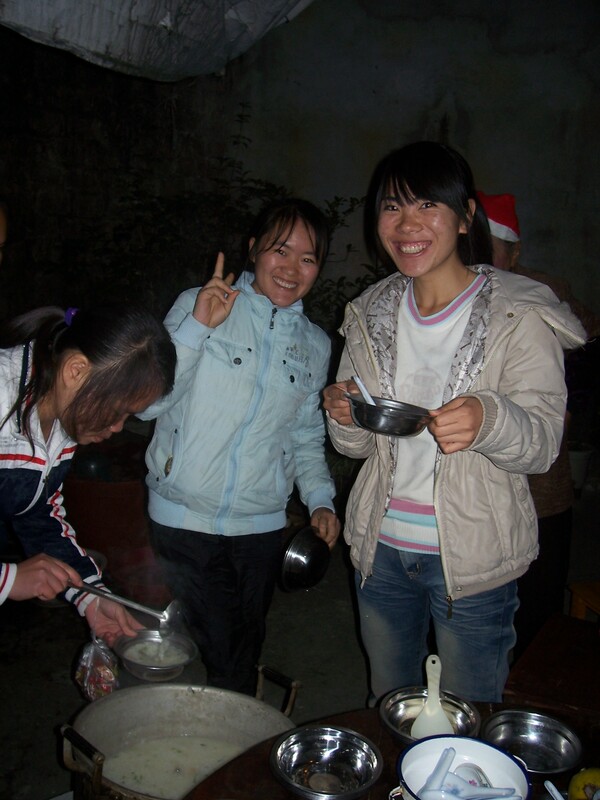 We were all invited outside into the back courtyard where several of the women had prepared a huge vat of homemade chicken and rice porridge. Everyone eagerly gathered around to be handed a steaming bowl. It was very much appreciated on our chilly, 40-degree-night under the stars. Cherry had 3 helpings, as did her classmates. 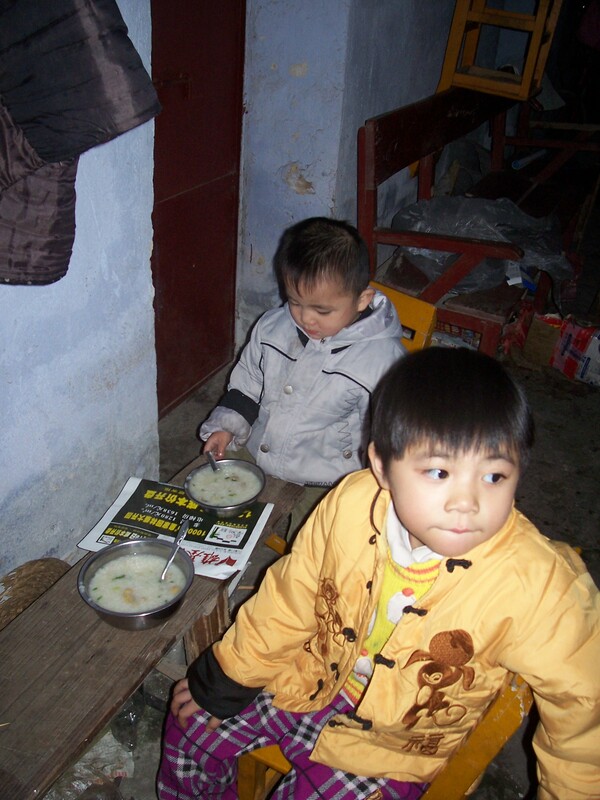 The kids enjoyed their porridge as well. Myself praising our cook for the evening. We laughed and complimented one another on our performances. 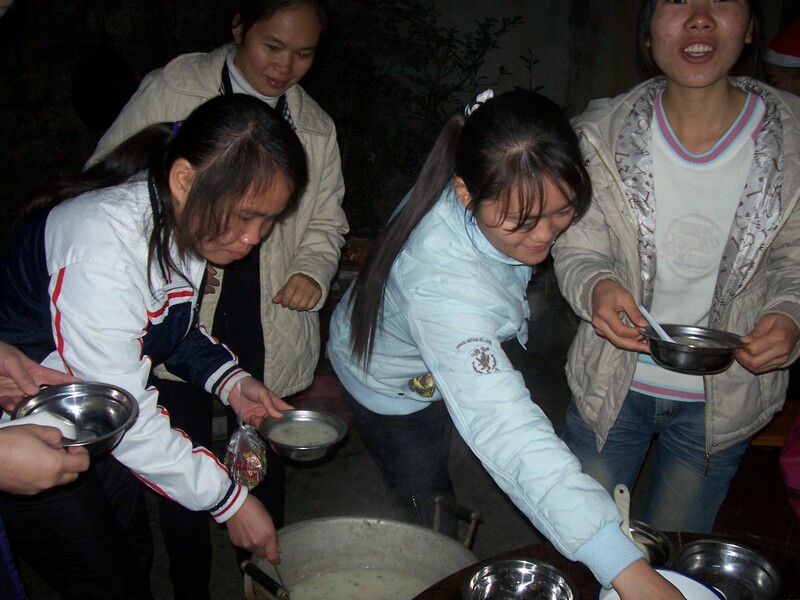 My starving students, used to dull dormitory food, had more than 3 helpings of soup which pleased the cooks to no ends. Our exciting, unique night together sped us home in high spirits as we trekked along the dark river road back to the college. We were a small worship group but a very blessed one on Christmas Eve. How Do Chinese Become Christians? The journey to Christ is always a fascinating one when asking Chinese Christians how they became Christians. Many were introduced to the Christian faith by friends and family members. Others, walking by churches and meeting points, were drawn to enter by the singing or praying they heard. In the case of my student, Cherry, her faith began with her grandmother’s illness. She was going blind. In her neighborhood, her grandmother’s Christian friend introduced her to Jesus’ love, invited her to church and the two of them prayed together. Within a few months, her sight was restored. After that, her grandmother was baptized. Her grandfather, seeing the power of having faith in God, likewise became a Christian. Cherry then attended church with her grandparents from a very early age until she also accepted Christ into her life. Stories such as this are always inspiring to hear. They bring a greater understanding of the power of God’s love and the need for us to share that love with others in any way we can. I like to think that Cherry and I were brought together for a reason here at this school. Cherry’s invite to her non-Christian classmates brought Liao Jinfeng (Kiley), Zhang Yuyu (Lani), and Mo Binyi (Honey) into our midst as first-time church-goers. 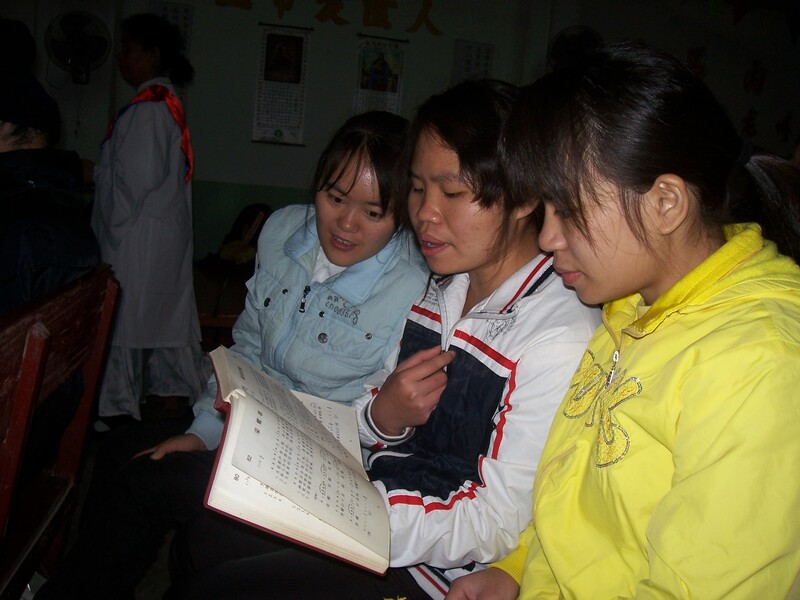 They heard the message of Layleader Zhou Ning, who told of Jesus’ commitment to us as children of God. They joined the two of us in our praise to the Lord in song. And we all enjoyed fellowship afterwards with kindhearted people who demystified what it is to be a Christian. Here’s wishing you 平安 （Ping Ahn, Peace) for the Year of the Dragon!